I am in acquisition mode after Christmas. I will admit that I may be the only one in blogland actively seeking more stuff. Almost all of the after Christmas posts have been about resolutions, and organizing, and purging, but me I am gearing up for a new year of blogging. I need stuff. Props. New "old items" to use in new vignettes. 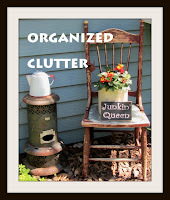 It's what my blog is all about, organizing clutter! This vintage Santa planter is unmarked but I found some like him on Etsy for sale. I think he was made in Japan. He probably won't be seen again until next November. $3. Still not sure why I picked up this die cast metal horse with Queen Elizabeth II riding side saddle. I do like royal souvenir items, but I really did think this was older than 1989 vintage, being metal and all. I guess it was from a "London Scene collection". $3. A black wedgwood look plate in black and white "Rhapsody Crescent" by George Jones. $2. A vintage poodle bookend. $2. Not exactly sure what this rooster is supposed to be. I do like roosters though, especially cheap ones. Maybe a sugar shaker and cream pitcher? $3. A Special Flowers Rose tea cup and saucer by Queen's Rosina China Co. $3. I have a hard time leaving a tea cup and saucer at the store at that price. This one also puzzles me why I brought it home. I like red. It's a hard board sign. Maybe not too old. I am sensing a vintage radio collection may be in my future. Yikes! Just what I need is another collection. I think this is a Zenith slogan. I bought a few more items at the antique shop, not thrifty buys, that I will show you soon. I am redoing a wall in my kitchen. what treasures you found!!! !That tea cup as an excellent buy!!!! Ha! I too am purging but at the same time bringing new to me stuff in! Goodwill got a car load from me yesterday. Seems only fitting as I am always helping to empty their shelves ;-) Happy New Year Carlene! Hi Carlene, I'm back but have a lot of catching up to do with everyone. I too was just about to check out what sales are being held tomorrow...just in case there is something I must have. Heaven knows I have plenty to keep me busy right now, but I've not been out junking or to yard sales or thrift stores in over a month. I'm sure I'm missing out on something fabulous. Love what you picked up. That Santa is very cool. He'll be fun to rediscover next year for sure. Happy new year! Your not the only one out looking for stuff, I went yesterday, and brought a I couldn't pass up vintage glass lamp. THe way I look at it is, you keep rotating treasures in and treasures out. What's a girl to do. Love that rose cup, and the rooster! You DID have some great finds, Carlene...I just love the Santa planter... SO cute! Thanks so much for stopping by! Ha, ha girl; I am in the mood to go thrifting too. Haven't made it out yet. But dying to see what new treasures I can find. I have to tell you, I just told hubby that I wanted to find some old radios and start a collection. Lol, we are too much alike! I wonder if we were seperated at birth. hee-hee! I am chomping at the bits. Hubby and I decided that we are going to have the basement finished. I can hardly sleep thinking of all I want to do. Yeah, I had to laugh too when you said you thought you were the only one out "shopping." I went to Goodwill. 75% off all their Christmas. Another thrift store had 50% off their Christmas. Another Dept.56 Snowbabie comes home to live with me! You crack me up! "Acquisition Mode"!!! I love your fun finds, but I'm envious of that easel especially!! The Santa planter is adorable! Looks like he's waiting to be filled with candy canes. And the poodle bookend is pretty cute, too. No shopping for me, though. I've got far too many "things" that need to be sorted through before I add to the mess! You found some great treasures! Love the sign and the wheel barrow! Sensing some great vignettes to come. I buy, keep, and resell all the time. Purge a little bit. I cannot go a week without going to one of my favorite thrift stores. Need to get up now and head into town except it's wicked cold. Love the rooster. I'm heading out to the thrift first thing on Monday. I'll drop another box of my old stuff off and probably come out of the store with a box of "new" stuff. I'm hoping they have a new crop of vintage Christmas coming into the store this weekend. I can't wait!!! Well, you found some good buys and fun things. I say if it all makes you happy, then why not. Life is too short to not do the things we enjoy. Look forward to seeing more posts in 2013. Saw your comment over at Gina's, and your blog name caught my interest. Great blog, and great finds! I especially love the metal horse, unique piece! Anxious to see what you do with your wonderful finds, Carlene! You are always so creative. Great finds, Carlene! I'm ready for a thrifting trip myself. And, I'm trying to simplify! I do have a box or two to drop off at Goodwill to off-set a buying spree. Makes me feel less guilty. Carlene you found some great things for sure. I love the poodle bookend! I'm going to be trying to organize my 'stuff' and figure out what to keep and what to share with others! Gah! That Queen diecast! My heart! It looks like you're getting some neat things. I've just started hitting GW again. I imagine a lot of people will be donating before the end of the year. The only thing I've found recently is an Arthur Court tray...under $3..and a new book I wanted to read. Good luck thrifting, and Happy New Year! Love your finds! The Rosina is lovely! One of my favorite makers. The Queen Elizabeth isn't from the coronation, she is in her annual Trooping The Colour uniform, usually in June. She stopped doing that in the early 1990s if I remember correctly. What a wonderful find! The chicken is really cute. You made some great finds! That wheelbarrow bowl is going to make a fantastic centerpiece! Love!